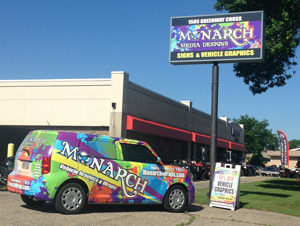 Monarch is your #1 Choice for High-Quality, Professional Vinyl Graphics for Vehicles in the Madison, WI Area. 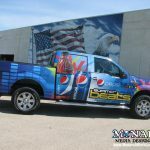 If you’re not limited to one or two colors on your vehicle, upgrade to full-color vinyl graphics. 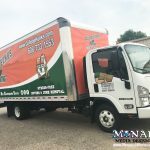 We incorporate full-color photos and logos. 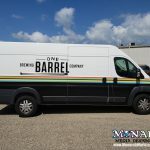 Mix that with some cut vinyl graphics–and you have a colorful, yet cost-effective way to advertise your business. 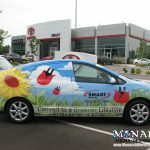 Use a combination of cut vinyl graphics and your full-color graphics to brand your vehicle on a smaller budget. We can match your logo colors instead of having to pick from our in-stock vinyl colors. 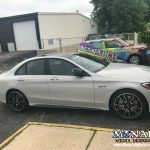 Looking for a bit more coverage? Try a Partial Wrap!